… more times than I can remember. Never even saw it… When a colleague suggested I take the teens there on our annual Teen Treks program and he described where it was, I was incredulous… There’s nothing there! I’m sure of it! Pff… I was wrong. 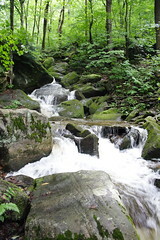 The Bent Run Waterfall Area is right across the road from Kinzua Dam’s “Big Bend Overlook” area. There is a little pull-off on the cliff side of the road and a sign. The trail is difficult and steep, but the views are spectacular. For locals reading this, think of Panama Rocks (well, maybe the rocks aren’t quite that big) – but with waterfalls… Spectacular! Makes me wonder how many other natural beauties I drive right by without noticing! 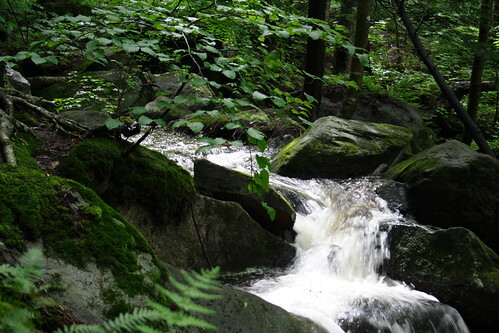 Thinking Panama Rocks with waterfalls – very wonderful Jen! Did you know Panama Rocks is for sale? Oh, and I saw Jamestown Audubon in the latest Birds and Blooms magazine! We always drive by amazing nature. So many times, while driving down the highway, I just wanted to hop off and explore a bit. That’s a really pretty spot, and you have some great shots of it on Flickr! Very pretty – and I’m always amazed by what beautiful things can be found just off the beaten path – even near commonly-used trails.